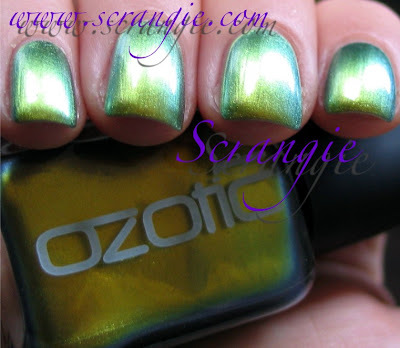 The newest addition to my Ozotic collection... Ozotic 507. I posted a look with this before, but I never posted how it looked before I stamped it. Green multichromes like Ozotic 507 aren't very common. 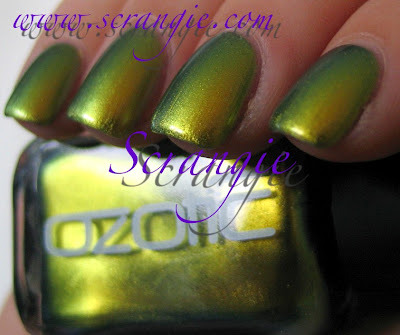 The closest colors I can think of are Chanel Peridot, which is more chrome-like, lighter and much less duochrome than this, and Morpheus 205, which is discontinued and very hard to find. 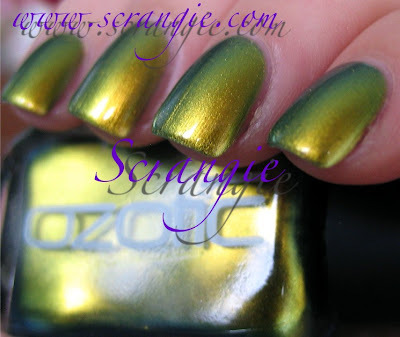 Ozotic 507. This polish starts with a spring green/yellow green frost base with some constantly visible dark olive green duochrome around the edges. Shift the angle or lighting a little and it will flash yellow, orangey-gold, midtone green, olive green, blue-green and blue. It shifts a lot, consistently, and always has two or three colors visible, unlike some duochromes which only shift dramatically at extreme angles. The formula on this is only tolerable. It's thick and runny and has a strange oily/airy/dragging texture to it. It doesn't feel like most other polishes. It applies somewhat sheer at first but looks fine with three coats, which is what I'm wearing here. It has severe bubbling issues due to this thick/airy texture. The dry time is also very long. For best results, I recommend doing as thin of a coat as you can possibly do and then waiting several minutes to allow the polish to dry a bit before the next one. This will help prevent clumping, pooling and bubbling and ease the long dry time. I definitely suggest a quick dry topcoat for this as well, if you don't already use one. 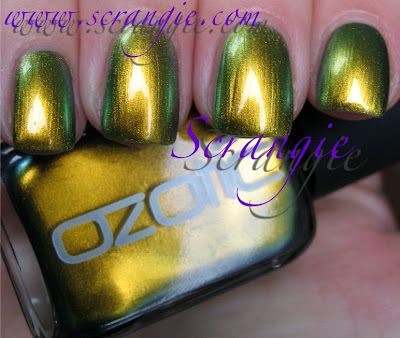 I'm not a big fan of Ozotic's formula, but I'm crazy about their colors. I can deal with the long dry time and the funny texture because pretty much every shade they have is incredible, and 507 is no exception. Their line consists of multiple duochromes/multichromes, holographics, glitters (including multichrome glitter), and even holographic duochromes. And now that there are two US/International sources for these beauties, they're easier than ever to obtain. If you're looking for Ozotic polishes, both Llarowe (in the US) and Picture Polish (in Australia) sell Ozotics, both ship internationally, and both carry this shade. Edit: Just learned that Harlow and Co. carries this shade, too. What a gorgeous shade, I think I could endure the drying time as well for something like this! Seems like it's easier to just put the Ozotics over a base coat of black. It's too bad that the formula isn't that great, but oh my gosh, that colour is INSANE! I need it right now! Wow never seen anything like it! Just plain love this polish color. Amazing color! I might brave the questionable formula for this level of gorgeous.